Your lips define your beauty—everything from your smile to your pout and the way people perceive you. The reason your lips appear red is because this thin skin reveals the blood vessels underneath. The skin of the lips contains no hair or sweat glands, and therefore is more susceptible to the elements and becomes dry and chapped easily. Also, lips are full of nerve endings, which makes them very sensitive. It keeps your skin soft, plump, and moist. That much most of us know. But what is collagen—really? You may not know that it’s a protein. It’s universal among all animals, too, in their connective tissue. Collagen helps bind everything and keep it firm. Our bodies produce collagen naturally. But as we age, we produce less and less of this remarkable protein. So skin becomes looser, more prone to wrinkles, and loses its elasticity. The lips become thinner, losing their plumpness, their firmness, even their color. Look at the lips of smokers. You’ll often see those spider web wrinkles around their lips. Sadly, many non-smokers have them too. Cinnamon (leaf) oil offers an antimicrobial capacity. Just mix a few drops of it with a carrier oil—coconut oil is a good choice—and apply it to affected skin. You’ll find it can treat rashes, acne, and light infections. The ability to dilate blood vessels is another property of cinnamon oil. The resulting increase in blood flow can lower levels of inflammation. Interestingly, however, a little mild inflammation comes in handy from time to time. The skin of our lips is thinner than the skin on our body. It lacks the sebaceous glands that keep skin moisturized. This is why our lips chap and dry so easily. Cinnamon has the effect of ever-so-slightly inflaming the uppermost layer of lip skin, increasing blood flow and giving your lips a fuller look. The most effective thing you can do to enhance the physical appearance of your lips are exercises. Exercises for the lips are invaluable for firming and toning the muscles around the lips, known as the 'orbicularis oris', contributing to fullness. What's more, they are quick and easy to do. See 2 excellent exercises in my article: How To Get Rid of Smoker's Lines Naturally. I have found that if you add 2 small passion fruit to the pineapple crush and have the drink daily for a few days, your lips will start to plump up. This was definitely not an allergic reaction because my husband’s lips also started to fill out a bit more. My friend noticed the change in my lips over a week and asked what I had done. She grows her own passion fruit and decided to try the same drink. The next time I saw her she had a fuller lip line and far smoother lips. My lips have kept their new shape and have not gone down since. We found this quite interesting. Another way to plump your lips is with cinnamon oil. Add 2 drops of cinnamon oil to 1 tablespoon of shea butter or coconut oil. Rub the solution gently on your lips for two to three minutes, and then leave it on your lips to maximize the results. You’ll soon feel a tingling in your lips. Within minutes, you’ll see a bit of a pout in your lips. 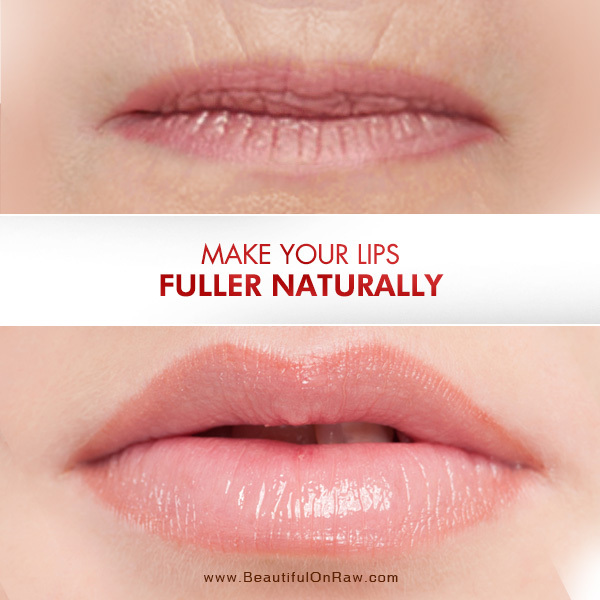 Your lips will stay plump for a few hours, then return to their normal shape. Be careful during preparation and use. Cinnamon oil is strong stuff, so know that adding too much into the solution can burn your lips. Should you feel any burning, remove it at once and prepare another mixture with half the concentration of cinnamon bark oil. Tip: If you ever want to test your lip solution without risk to your lips, try a little sample on a less visible part of the body—the underside of your upper arm, for instance. One of my favorite beauty tips for youthful, pouty lips: Use our RejuvaCup right after applying our Sensual Lip Balm. I like cinnamon oil effect on the lips, and found that a low-concentration solution works for me. That’s why we’ve included 3% cinnamon oil in our Sensual Lip Balm. It will give you a nice plumping effect, but it’s gentle, so you can use it several times a day if you like.